Brenda Marks says she takes the tagging personally. She's president of the neighborhood group Oak Lawn Committee, which maintains the Legacy of Love monument in Dallas. The monument was among several landmarks vandalized over the weekend. Vandals spray-painted the numerals 666 in red, in at least six locations in Dallas, including two gathering places for gay and lesbians. The graffiti is now being investigated as hate crimes. Six police reports have been filed, but Monica Cordova, a Dallas Police Department spokeswoman, says detectives learned Monday of three more sites via social media. Many of the sites are in Oak Lawn. Targets included the Cathedral of Hope, the world’s largest gay and lesbian church, and the Legacy of Love monument. “It’s being treated as a hate crime as of right now, until we can eliminate that, because of where it happened," she said. Vandals tagged locations in red paint with “666,” which some associate with Satan. Brenda Marks, president of the Oak Lawn Committee, which maintains the Legacy of Love monument, says she takes the tagging personally. Overnight, volunteers from the nearby Cathedral of Hope managed to wash off most of the red 666. 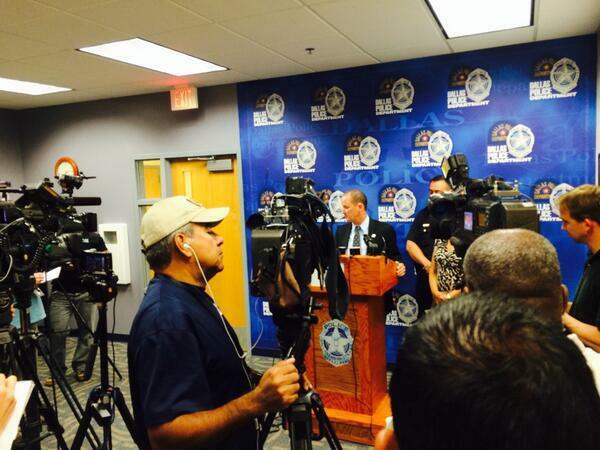 Dallas police held a press conference Monday afternoon to discuss the graffiti incidents in Oak Lawn. Also tagged: the offices of The Dallas Morning News and The Dallas Observer. The vandalism came as cities across the country celebrated gay pride over the weekend with parades and festivals.